In spite of their initial unwillingness to talk about anything Athlon related, the very well respected motherboard manufacturer ASUS is back with another Slot-A motherboard for the Athlon product. If you all remember back to the controversy surrounding the K7M, their first Athlon motherboard solution, ASUS was doing everything but promoting their first and only Athlon product. Although never officially confirmed by ASUS (for obvious reasons), most upset Athlon supporters attributed ASUS' blatant disregard for the promotion of the K7M to pressure from Intel not to support AMD's threatening Athlon platform, threatening to the Pentium III that is. ASUS eventually posted a K7M page on their website but they still refer to it as a K7 OEM solution, a possible attempt to establish some distance between the company and any Athlon related products. The K7M was sort of a double whammy for ASUS because not only was it an Athlon motherboard, it also featured the 686A South Bridge manufactured by VIA, a company that has been under attack by various lawsuits from Intel themselves for alleged patent infringement. 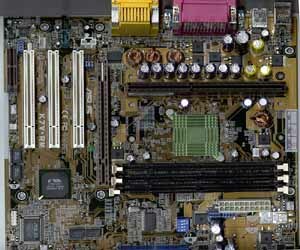 From the motherboard manufacturers we have talked to, featuring VIA chipsets in their motherboard solutions received just as many, if not more, bad looks from Intel (of course unofficially) than producing Athlon motherboards. Luckily, times are changing. Intel's attempts to keep VIA chipsets from being exported to the United States have not been successful, and as mentioned in our motherboard coverage at this year's CeBIT in Hannover, Germany, the support from motherboard manufacturers for the Athlon platform is tremendous. This incredible support is due in part to the release of VIA's KX133 chipset which helps keep the Athlon platform competitive with its Intel counterpart. Boasting VIA's new KX133 chipset is ASUS' successor to the K7M (ATX) and the K7M-RM (microATX), the K7V. Here we'll be taking a look at the K7V-RM, the microATX version of the K7V. For those of you that aren't interested in a microATX motherboard, the K7V should be virtually identical to the K7V-RM that we are reviewing here with the exception of more expansion slots because of the larger form factor. While ASUS may not be actively promoting these motherboards just yet, as we've come to know in the past, just about anything that carries the ASUS name has been of the highest in quality. The K7V-RM is actually the successor to the K7M-RM which is the less popular brother of the K7M. Just like the K7M-RM was to the K7M, the K7V-RM is a microATX version of the K7V. 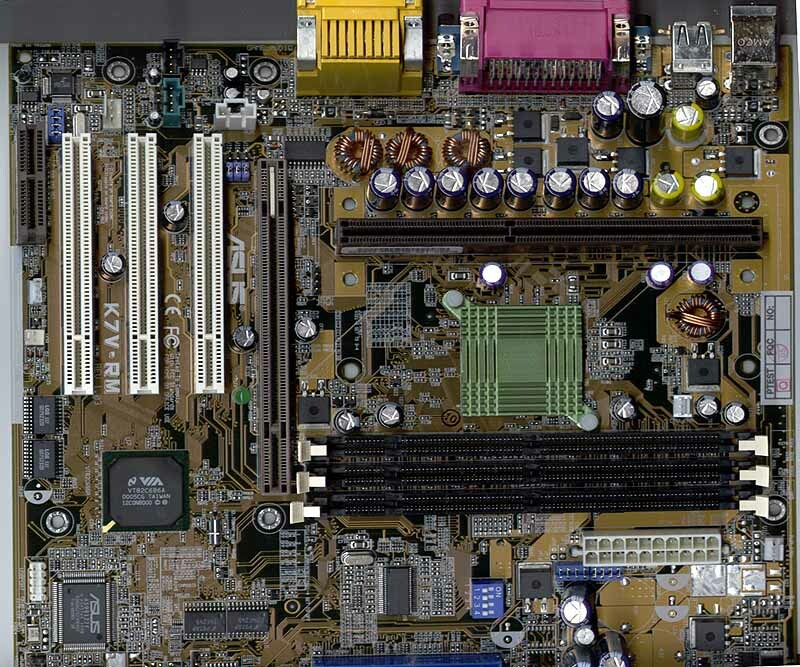 Being a microATX motherboard, the K7V-RM is targeted primarily at OEMs and system integrators looking to produce low-cost Athlon systems, something that using the microATX form factor can help accomplish. With the price of Athlons dropping considerably, and the cost of the KX133 chipset fairly low already, the K7V-RM turns out to be a very cost effective motherboard. On the North side of the KX133 chipset, we have the 371 North Bridge that brings the main features of the KX133 to the table: 133MHz memory bus and AGP 4X support. The beauty of the 371's memory controller is that it can run your memory at either 133MHz or 100MHz using a multiplier of the FSB frequency. So those users with PC133 SDRAM can take advantage of the increased bandwidth (1.06GB/s vs 800MB/s) over PC100 SDRAM, while allowing backwards compatibility with older PC100 SDRAM. While the memory controller boasts support for Virtual Channel SDRAM there is a general lack of VC-SDRAM in the market right now and we don't expect there to be an influx of chips or modules anytime soon. On the upside of things, we have been unable to note any serious performance increase due to VC-SDRAM so it's not a big loss that you can't find any VC-SDRAM modules around. In spite of its microATX form factor, the K7V-RM is outfitted with 3 DIMM slots capable of accepting PC100/PC133 or VC100/VC133 SDRAM, as we just mentioned, due to availability it's unlikely that you'll find any VC100/VC133 modules to use on this board in the first place. The K7V-RM (as well as the K7V) features an AGP Pro slot which is capable of AGP 4X transfers in addition to offering support for AGP Pro50 graphics cards. AGP Pro is simply an extension to the AGP specification that allows for more power (in the case of AGP Pro50 cards, between 25 and 50W of power) to be delivered to graphics cards that need it. While it's questionable how well an AGP Pro card would work on an Athlon system, considering how much power the Athlon already draws, ASUS seems to be outfitting all of their latest motherboards with AGP Pro connectors including the K7V-RM. This feature doesn't really help nor hurt the motherboard, but it is nice to know that ASUS included a little plastic spacer at the top of the slot to prevent the accidental insertion of a regular AGP card into the wrong section of the slot. Doing so would probably end up frying your card since those upper 20 pins are mainly additional power pins so it's a well needed safety precaution on ASUS' part. In our compatibility tests, we found no problems with running any of the latest graphics accelerators in AGP 4X mode on the K7V-RM, it looks like VIA has worked out all of the initial problems with AGP 4X compatibility and their chipsets which is definitely a good sign for them.